A lavish ceremony has been held to welcome the Olympic torch to Beijing, which is due to host the Olympic Games in August. President Hu Jintao took part in the televised event at Tiananmen Square, holding the torch aloft before passing it to Chinese sporting icon Liu Xiang. Security was tight amid concerns over possible anti-government protests. Last week protesters opposed to Chinese actions in Tibet clashed with police at the torch-lighting ceremony in Greece. On Tuesday the torch goes to Almaty in Kazakhstan, its next stop on a tour of 20 countries. The 130-day relay - the longest ever, and with the most torch-bearers - underlines the importance China is giving to the Games, which it hopes to use as a showcase for its rapid economic and political rise. But activists say they intend to use the torch relay to highlight concerns over violence in Tibet, China's role in Sudan and domestic human rights issues. The flame arrived from Greece early on Monday, aboard a chartered Air China plane, and was greeted at Beijing airport by hundreds of flag-waving schoolchildren. Students and workers sang the Olympic slogan One World, One Dream. The torch was then taken to the city centre, for an elaborate ceremony in Tiananmen Square. President Hu Jintao lit a cauldron on a red-carpeted rostrum, and then handed the torch to Olympic champion hurdler Liu Xiang, who ran the first leg of the relay. 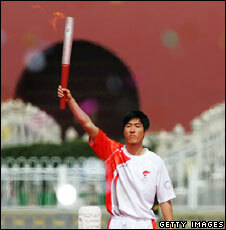 "I declare the torch relay of the Beijing 2008 Olympic Games begun," said Mr Hu. Sunday's formal torch handover was held in the Panathinaiko Stadium in Athens, where the first modern Olympics took place in 1896. Minos Kyriakou, president of the Hellenic Olympic Committee, passed the flame to the chief organiser of the Beijing Games, Liu Qi. "The Olympic flame is the timeless symbol which stirs admiration, pride and faith [in] the Olympic ideals and values," said Mr Kyriakou. "I hope the world community welcomes the flame and honours it". But there are fears the torch relay will be a magnet for anti-China protests, and activists have already been planning demonstrations in London, Paris and San Francisco - where the torch is heading in the next 10 days. At last week's flame-lighting ceremony in Greece, campaigners broke through police lines and unfurled a Tibetan flag before being dragged away. On Sunday, as the torch was handed over to the Chinese, a small group of protesters tried to unfurl a banner which said "Stop genocide in Tibet", but failed to enter the stadium. A further flashpoint for protests could be Tibet itself. The torch passes through Tibet in May, en route to Mount Everest, and then again when it goes through the city of Lhasa in June. Despite the massive security presence in Lhasa, there was a fresh protest there over the weekend, according to Tibetan activist groups.